Rear View Camera, STARLINK, Keyless Entry, SiriusXM, Steering Wheel Audio Control! This gray wagon has an automatic transmission and is powered by a 2.0L H4 16V GDI DOHC engine. Equipped with that economical motor it gets 8.4 L/100 km in the city and uses just 6.6 L/100 km out on the highway according to Transport Canada. Our Impreza's trim level is 5-dr Convienence AT. Loaded with all the connectivity you could want, this unique vehicle comes with a 6.5 inch touchscreen infotainment system with STARLINK smartphone integration (including Aha radio), Apple CarPlay and Android Auto functionality, and steering wheel controlled audio. This Impreza also comes with power windows, all-wheel drive, a rear view camera, and keyless entry plus much more. 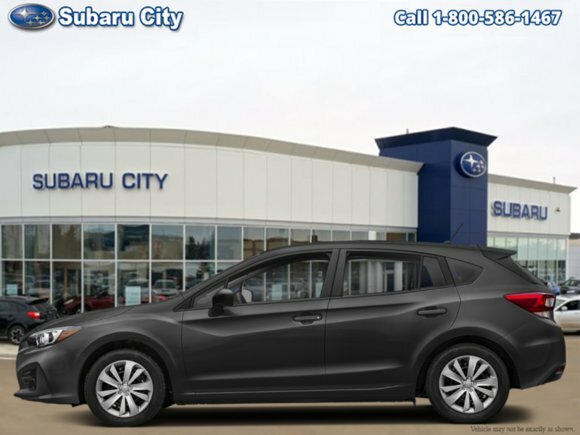 This vehicle has been upgraded with the following features: Rear View Camera, Starlink, Keyless Entry, Siriusxm, Steering Wheel Audio Control, All Wheel Drive, Power Windows. Want to try the 2019 Subaru Impreza 5-dr Convienence AT?